Zimbabwe news !!! The latest and breaking news from Zimbabwe !! : The first Gay Wedding in Africa : Watch Video !!! 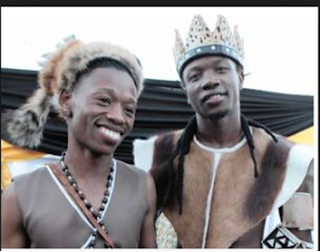 Two young men tied the knot in a rare South African gay wedding in KwaDukuza (Stanger) on Saturday. In what was described as the town’s first gay marriage, Tshepo Modisane and Thoba Sithole, both 27, walked down the aisle in front of 200 guests at the Stanger Siva Sungam community hall. The wedding was a jubilant, exciting affair, attracting even uninvited members of the local community. Thoba, a Joburg-based IT specialist, is from Shakaville, KwaDukuza and Tshepo an audit manager at PwC. They have known each other for years and dated on and off, before stabilising their relationship. Now tht they are wedded, they will take on the double-barrelled surname of Sithole-Modisane. The couple appeared to enjoy the support from the community, family and friends. The couple are reportedly planning to have children through a surrogate. “Family is important to us and that is the number one reason why we want to have children,” said Thoba.